Biomimetics or biomimicry is the imitation of the models, systems, and elements of nature for the purpose of solving complex human problems. The terms "biomimetics" and "biomimicry" derive from Ancient Greek: βίος (bios), life, and μίμησις (mīmēsis), imitation, from μιμεῖσθαι (mīmeisthai), to imitate, from μῖμος (mimos), actor. A closely related field is bionics. Living organisms have evolved well-adapted structures and materials over geological time through natural selection. Biomimetics has given rise to new technologies inspired by biological solutions at macro and nanoscales. Humans have looked at nature for answers to problems throughout our existence. Nature has solved engineering problems such as self-healing abilities, environmental exposure tolerance and resistance, hydrophobicity, self-assembly, and harnessing solar energy. One of the early examples of would-be biomimicry was the study of birds to enable human flight. Although never successful in creating a "flying machine", Leonardo da Vinci (1452–1519) was a keen observer of the anatomy and flight of birds, and made numerous notes and sketches on his observations as well as sketches of "flying machines". The Wright Brothers, who succeeded in flying the first heavier-than-air aircraft in 1903, allegedly derived inspiration from observations of pigeons in flight. During the 1950s the American biophysicist and polymath Otto Schmitt developed the concept of "biomimetics". During his doctoral research he developed the Schmitt trigger by studying the nerves in squid, attempting to engineer a device that replicated the biological system of nerve propagation. He continued to focus on devices that mimic natural systems and by 1957 he had perceived a converse to the standard view of biophysics at that time, a view he would come to call biomimetics. Biophysics is not so much a subject matter as it is a point of view. It is an approach to problems of biological science utilizing the theory and technology of the physical sciences. Conversely, biophysics is also a biologist's approach to problems of physical science and engineering, although this aspect has largely been neglected. In 1969 Schmitt used the term “biomimetic“ in the title one of his papers, and by 1974 it had found its way into Webster's Dictionary, bionics entered the same dictionary earlier in 1960 as "a science concerned with the application of data about the functioning of biological systems to the solution of engineering problems". Bionic took on a different connotation when Martin Caidin referenced Jack Steele and his work in the novel Cyborg which later resulted in the 1974 television series The Six Million Dollar Man and its spin-offs. The term bionic then became associated with "the use of electronically operated artificial body parts" and "having ordinary human powers increased by or as if by the aid of such devices". Because the term bionic took on the implication of supernatural strength, the scientific community in English speaking countries largely abandoned it. The term biomimicry appeared as early as 1982. Biomimicry was popularized by scientist and author Janine Benyus in her 1997 book Biomimicry: Innovation Inspired by Nature. Biomimicry is defined in the book as a "new science that studies nature's models and then imitates or takes inspiration from these designs and processes to solve human problems". Benyus suggests looking to Nature as a "Model, Measure, and Mentor" and emphasizes sustainability as an objective of biomimicry. Biomimetics could in principle be applied in many fields. Because of the diversity and complexity of biological systems, the number of features that might be imitated is large. Biomimetic applications are at various stages of development from technologies that might become commercially usable to prototypes. Murray's law, which in conventional form determined the optimum diameter of blood vessels, has been re-derived to provide simple equations for the pipe or tube diameter which gives a minimum mass engineering system. Aircraft wing design and flight techniques are being inspired by birds and bats. Biorobots based on the physiology and methods of locomotion of animals include BionicKangaroo which moves like a kangaroo, saving energy from one jump and transferring it to its next jump. Kamigami Robots, a children's toy, mimic cockroach locomotion to run quickly and efficiently over indoor and outdoor surfaces. Researchers studied the termite's ability to maintain virtually constant temperature and humidity in their termite mounds in Africa despite outside temperatures that vary from 1.5 °C to 40 °C (35 °F to 104 °F). Researchers initially scanned a termite mound and created 3-D images of the mound structure, which revealed construction that could influence human building design. The Eastgate Centre, a mid-rise office complex in Harare, Zimbabwe, stays cool without air conditioning and uses only 10% of the energy of a conventional building of the same size. In structural engineering, the Swiss Federal Institute of Technology (EPFL) has incorporated biomimetic characteristics in an adaptive deployable "tensegrity" bridge. The bridge can carry out self-diagnosis and self-repair. The arrangement of leaves on a plant has been adapted for better solar power collection. Analysis of the elastic deformation happening when a pollinisator lands on the sheath-like perch part of the flower Strelitzia reginae (known as Bird-of-Paradise flower) has inspired architects and scientists from the University of Freiburg and University of Stuttgart for the creation of hingeless shading systems that can react to their environment. These bio-inspired products is sold under the name Flectofin. Other hingeless bioinspired system includes Flectofold. Flectofold has been inspired from the trapping system developed by the carnivorous plant Aldrovanda vesiculosa. There is a great need for new structural materials that are light weight but offer exceptional combinations of stiffness, strength and toughness. Such materials would need to be manufactured into bulk materials with complex shapes at high volume and low cost and would serve a variety of fields such as construction, transportation, energy storage and conversion. In a classic design problem, strength and toughness are more likely to be mutually exclusive i.e., strong materials are brittle and tough materials are weak. However, natural materials with complex and hierarchical material gradients that span from nano- to macro-scales are both strong and tough. Generally, most natural materials utilize limited chemical components but complex material architectures that give rise to exceptional mechanical properties. Understanding the highly diverse and multi functional biological materials and discovering approaches to replicate such structures will lead to advanced and more efficient technologies. Bone, nacre (abalone shell), teeth, the dactyl clubs of stomatopod shrimps and bamboo are great examples of damage tolerant materials. The exceptional resistance to fracture of bone is due to complex deformation and toughening mechanisms that operate at spanning different size scales - nanoscale structure of protein molecules to macroscopic physiological scale. Nacre exhibits similar mechanical properties however with rather simpler structure. Nacre shows a brick and mortar llike structure with thick mineral layer (0.2∼0.9-μm) of closely packed aragonite structures and thin organic matrix (∼20-nm). While thin films and micrometer sized samples that mimic these structures are already produced, successful production of bulk biomimetic structural materials is yet to be realized. However, numerous processing techniques have been proposed for producing nacre like materials. Biomorphic mineralization is a technique that produces materials with morphologies and structures resembling those of natural living organisms by using bio-structures as templates for mineralization. Compared to other methods of material production, biomorphic mineralization is facile, environmentally benign and economic. Freeze casting (Ice templating), an inexpensive method to mimic natural layered structures was employed by researchers at Lawrence Berkeley National Laboratory to create alumina-Al-Si and IT HAP-epoxy layered composites that match the mechanical properties of bone with an equivalent mineral/ organic content. Various further studies  also employed similar methods to produce high strength and high toughness composites involving a variety of constituent phases. Recent studies demonstrated production of cohesive and self supporting macroscopic tissue constructs that mimic living tissues by printing tens of thousands of heterologous picoliter droplets in software-defined, 3D millimeter-scale geometries. Efforts are also taken up to mimic the design of nacre in artificial composite materials using fused deposition modelling  and the helicoidal structures of stomatopod clubs in the fabrication of high performance carbon fiber-epoxy composites. Various established and novel additive manufacturing technologies like PolyJet printing, direct ink writing, 3D magnetic printing, multi-material magnetically assisted 3D printing and magnetically-assisted slip casting have also been utilized to mimic the complex micro-scale architectures of natural materials and provide huge scope for future research. Spider web silk is as strong as the Kevlar used in bulletproof vests. Engineers could in principle use such a material, if it could be reengineered to have a long enough life, for parachute lines, suspension bridge cables, artificial ligaments for medicine, and other purposes. The self-sharpening teeth of many animals have been copied to make better cutting tools. New ceramics that exhibit giant electret hysteresis have also been realized. In general in biological systems, self healing occurs via chemical signals released at the site of fracture which initiate a systemic response that transport repairing agents to the fracture site thereby promoting autonomic healing. To demonstrate the use of micro-vascular networks for autonomic healing, researchers developed a microvascular coating–substrate architecture that mimics human skin. Bio-inspired self-healing structural color hydrogels that maintain the stability of an inverse opal structure and its resultant structural colors were developed. A self-repairing membrane inspired by rapid self-sealing processes in plants was developed for inflatable light weight structures such as rubber boats or Tensairity® constructions. The researchers applied a thin soft cellular polyurethane foam coating on the inside of a fabric substrate, which closes the crack if the membrane is punctured with a spike. Self-healing materials, polymers and composite materials capable of mending cracks have been produced based on biological materials. Surfaces that recreate properties of shark skin are intended to enable more efficient movement through water. Efforts have been made to produce fabric that emulates shark skin. Surface tension biomimetics are being researched for technologies such as hydrophobic or hydrophilic coatings and microactuators. Some amphibians, such as tree and torrent frogs and arboreal salamanders, are able to attach to and move over wet or even flooded environments without falling. This kind of organisms have toe pads which are permanently wetted by mucus secreted from glands that open into the channels between epidermal cells. They attach to mating surfaces by wet adhesion and they are capable of climbing on wet rocks even when water is flowing over the surface. Tire treads have also been inspired by the toe pads of tree frogs. Marine mussels can stick easily and efficiently to surfaces underwater under the harsh conditions of the ocean. Mussels use strong filaments to adhere to rocks in the inter-tidal zones of wave-swept beaches, preventing them from being swept away in strong sea currents. Mussel foot proteins attach the filaments to rocks, boats and practically any surface in nature including other mussels. These proteins contain a mix of amino acid residues which has been adapted specifically for adhesive purposes. Researchers from the University of California Santa Barbara borrowed and simplified chemistries that the mussel foot uses to overcome this engineering challenge of wet adhesion to create copolyampholytes, and one-component adhesive systems with potential for employment in nanofabrication protocols. Other research has proposed adhesive glue from mussels. Leg attachment pads of several animals, including many insects (e.g. beetles and flies), spiders and lizards (e.g. geckos), are capable of attaching to a variety of surfaces and are used for locomotion, even on vertical walls or across ceilings. Attachment systems in these organisms have similar structures at their terminal elements of contact, known as setae. Such biological examples have offered inspiration in order to produce climbing robots, boots and tape. Synthetic setae have also been developed for the production of dry adhesives. Biomimetic materials are gaining increasing attention in the field of optics and photonics. There are still little known bioinspired or biomimetic products involving the photonic properties of plants or animals. However, understanding how nature designed such optical materials from biological resources is worth pursuing and might lead to future commercial products. For instance, the chiral self-assembly of cellulose inspired by the Pollia condensata berry has been exploited to make optically active films. Such films are made from cellulose which is a biodegradable and biobased resource obtained from wood or cotton. The structural colours can potentially be everlasting and have more vibrant colour than the ones obtained from chemical absorption of light. Pollia condensata is not the only fruit showing a structural coloured skin, other berries such as Margaritaria nobilis does. These fruits show iridescent colors in the blue-green region of the visible spectrum which gives the fruit a strong metallic and shiny visual appearance. The structural colours come from the organisation of cellulose chains in the fruit's epicarp, a part of the fruit skin. Each cell of the epicarp is made of a multilayered envelope that behaves like a Bragg reflector. However, the light which is reflected from the skin of these fruits is not polarised unlike the one arising from man-made replicates obtained from the self-assembly of cellulose nanocrystals into helicoids, which only reflect left-handed circularly polarised light. The fruit of Elaeocarpus angustifolius also show structural colour that come arises from the presence of specialised cells called iridosomes which have layered structures. Similar iridosomes have also been found in Delarbrea michieana fruits. In plants, multi layer structures can be found either at the surface of the leaves (on top of the epidermis), such as in Selaginella willdenowii or within specialized intra-cellular organelles, the so-called iridoplasts, which are located inside the cells of the upper epidermis. For instance, the rain forest plants Begonia pavonina have iridoplasts located inside the epidermal cells. Structural colours have also been found in several algae, such as in the red alga Chondrus crispus (Irish Moss). Vibrant blue color of Morpho butterfly due to structural coloration has been mimicked by a variety of technologies. Structural coloration produces the rainbow colours of soap bubbles, butterfly wings and many beetle scales. Phase-separation has been used to fabricate ultra-white scattering membranes from polymethylmethacrylate, mimicking the beetle Cyphochilus. 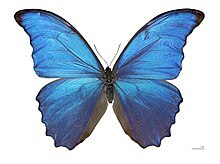 Morpho butterfly wings are structurally coloured to produce a vibrant blue that does not vary with angle. This effect can be mimicked by a variety of technologies. Lotus Cars claim to have developed a paint that mimics the Morpho butterfly's structural blue colour. In 2007, Qualcomm commercialised an interferometric modulator display technology, "Mirasol", using Morpho-like optical interference. In 2010, the dressmaker Donna Sgro made a dress from Teijin Fibers' Morphotex, an undyed fabric woven from structurally coloured fibres, mimicking the microstructure of Morpho butterfly wing scales. Holistic planned grazing, using fencing and/or herders, seeks to restore grasslands by carefully planning movements of large herds of livestock to mimic the vast herds found in nature. The natural system being mimicked and used as a template is grazing animals concentrated by pack predators that must move on after eating, trampling, and manuring an area, and returning only after it has fully recovered. Developed by Allan Savory, who in turn was inspired by the work of André Voisin, this method of grazing holds tremendous potential in building soil, increasing biodiversity, reversing desertification, and mitigating global warming, similar to what occurred during the past 40 million years as the expansion of grass-grazer ecosystems built deep grassland soils, sequestering carbon and cooling the planet. Permaculture is a set of design principles centered around whole systems thinking, simulating or directly utilizing the patterns and resilient features observed in natural ecosystems. It uses these principles in a growing number of fields from regenerative agriculture, rewilding, community, and organizational design and development. Protein folding has been used to control material formation for self-assembled functional nanostructures. Polar bear fur has inspired the design of thermal collectors and clothing. The light refractive properties of the moth's eye has been studied to reduce the reflectivity of solar panels. Scanning electron micrograph of rod shaped tobacco mosaic virus particles. The Bombardier beetle's powerful repellent spray inspired a Swedish company to develop a "micro mist" spray technology, which is claimed to have a low carbon impact (compared to aerosol sprays). The beetle mixes chemicals and releases its spray via a steerable nozzle at the end of its abdomen, stinging and confusing the victim. Most viruses have an outer capsule 20 to 300 nm in diameter. Virus capsules are remarkably robust and capable of withstanding temperatures as high as 60 °C; they are stable across the pH range 2-10. Viral capsules can be used to create nano device components such as nanowires, nanotubes, and quantum dots. Tubular virus particles such as the tobacco mosaic virus (TMV) can be used as templates to create nanofibers and nanotubes, since both the inner and outer layers of the virus are charged surfaces which can induce nucleation of crystal growth. This was demonstrated through the production of platinum and gold nanotubes using TMV as a template. Mineralized virus particles have been shown to withstand various pH values by mineralizing the viruses with different materials such as silicon, PbS, and CdS and could therefore serve as a useful carriers of material. A spherical plant virus called cowpea chlorotic mottle virus (CCMV) has interesting expanding properties when exposed to environments of pH higher than 6.5. Above this pH, 60 independent pores with diameters about 2 nm begin to exchange substance with the environment. The structural transition of the viral capsid can be utilized in Biomorphic mineralization for selective uptake and deposition of minerals by controlling the solution pH. Possible applications include using the viral cage to produce uniformly shaped and sized quantum dot semiconductor nanoparticles through a series of pH washes. This is an alternative to the apoferritin cage technique currently used to synthesize uniform CdSe nanoparticles. Such materials could also be used for targeted drug delivery since particles release contents upon exposure to specific pH levels. ^ Vincent, Julian F. V.; et al. (22 August 2006). "Biomimetics: its practice and theory". Journal of the Royal Society Interface. 3 (9): 471–482. doi:10.1098/rsif.2006.0127. PMC 1664643. PMID 16849244. Retrieved 7 April 2015. ^ a b Mary McCarty. "Life of bionics founder a fine adventure". Dayton Daily News, 29 January 2009. ^ Romei, Francesca (2008). Leonardo Da Vinci. The Oliver Press. p. 56. ISBN 978-1-934545-00-3. ^ a b Vincent, Julian F.V. ; Bogatyreva, Olga A.; Bogatyrev, Nikolaj R.; Bowyer, Adrian; Pahl, Anja-Karina (21 August 2006). "Biomimetics: its practice and theory". Journal of the Royal Society Interface. 3 (9): 471–482. doi:10.1098/rsif.2006.0127. PMC 1664643. PMID 16849244. ^ "Otto H. Schmitt, Como People of the Past". Connie Sullivan, Como History Article. He developed the trigger by studying the nerves in squid and trying to engineer a device that replicated the natural system by which squid nerves propagate. ^ Vincent, Julian F. V. (November 2009). "Biomimetics -- a review". Journal of Engineering in Medicine. Proceedings of the Institution of Mechanical Engineers. Part H. 223 (8): 919–939. doi:10.1243/09544119JEIM561. PMID 20092091. ^ Schmitt O. Third Int. Biophysics Congress. 1969. Some interesting and useful biomimetic transforms. p. 297. ^ Soanes, Catherine; Hawker, Sara (2008). Compact Oxford English Dictionary. ISBN 978-0-19-953296-4. ^ Vincent, JFV (2009). "Biomimetics — a review". Proc. Inst. Mech. Eng. 223 (8): 919–939. doi:10.1243/09544119JEIM561. PMID 20092091. ^ Merrill, Connie Lange (1982). "Biomimicry of the Dioxygen Active Site in the Copper Proteins Hemocyanin and Cytochrome Oxidase". Rice University. ^ a b Benyus, Janine (1997). Biomimicry: Innovation Inspired by Nature. New York, USA: William Morrow & Company. ISBN 978-0-688-16099-9. ^ Bhushan, Bharat (15 March 2009). "Biomimetics: lessons from nature-an overview". Philosophical Transactions of the Royal Society A: Mathematical, Physical and Engineering Sciences. 367 (1893): 1445–1486. Bibcode:2009RSPTA.367.1445B. doi:10.1098/rsta.2009.0011. PMID 19324719. ^ a b Williams, Hugo R.; Trask, Richard S.; Weaver, Paul M.; Bond, Ian P. (2008). "Minimum mass vascular networks in multifunctional materials". Journal of the Royal Society Interface. 5 (18): 55–65. doi:10.1098/rsif.2007.1022. PMC 2605499. PMID 17426011. ^ The Engineer (31 March 2017). "The evolution of the aircraft wing". Retrieved 10 December 2018. ^ "Drone with legs can perch, watch and walk like a bird". Tech. New Scientist. 27 January 2014. Retrieved 17 July 2014. ^ Ackerman, Evan (2 Apr 2014). "Festo's Newest Robot Is a Hopping Bionic Kangaroo". spectrum.ieee.org. IEEE Spectrum. Retrieved 17 Apr 2014. ^ "Robotics Highlight: Kamigami Cockroach Inspired Robotics". CRA. 2016-07-18. Retrieved 2017-05-16. ^ Korkmaz, Sinan; Bel Hadj Ali, Nizar; Smith, Ian F.C. (2011). "Determining Control Strategies for Damage Tolerance of an Active Tensegrity Structure" (PDF). Engineering Structures. 33 (6): 1930–1939. CiteSeerX 10.1.1.370.6243. doi:10.1016/j.engstruct.2011.02.031. ^ "The Secret of the Fibonacci Sequence in Trees". 2011 Winning Essays. American Museum of Natural History. 1 May 2014. Retrieved 17 July 2014. ^ Lienhard, J; Schleicher, S; Poppinga, S; Masselter, T; Milwich, M; Speck, T; Knippers, J (2011-11-29). "Flectofin: a hingeless flapping mechanism inspired by nature". Bioinspiration & Biomimetics. 6 (4): 045001. Bibcode:2011BiBi....6d5001L. doi:10.1088/1748-3182/6/4/045001. ISSN 1748-3182. PMID 22126741. ^ Körner, A; Born, L; Mader, A; Sachse, R; Saffarian, S; Westermeier, A S; Poppinga, S; Bischoff, M; Gresser, G T (2017-12-12). "Flectofold—a biomimetic compliant shading device for complex free form facades". Smart Materials and Structures. 27 (1): 017001. doi:10.1088/1361-665x/aa9c2f. ISSN 0964-1726. ^ a b Wegst, Ulrike G. K.; Bai, Hao; Saiz, Eduardo; Tomsia, Antoni P.; Ritchie, Robert O. (2014-10-26). "Bioinspired structural materials". Nature Materials. 14 (1): 23–36. doi:10.1038/nmat4089. ISSN 1476-1122. PMID 25344782. ^ Launey, Maximilien E.; Buehler, Markus J.; Ritchie, Robert O. (June 2010). "On the Mechanistic Origins of Toughness in Bone". Annual Review of Materials Research. 40 (1): 25–53. Bibcode:2010AnRMS..40...25L. CiteSeerX 10.1.1.208.4831. doi:10.1146/annurev-matsci-070909-104427. ISSN 1531-7331. ^ Wang, Rizhi; Gupta, Himadri S. (2011-08-04). "Deformation and Fracture Mechanisms of Bone and Nacre". Annual Review of Materials Research. 41 (1): 41–73. Bibcode:2011AnRMS..41...41W. doi:10.1146/annurev-matsci-062910-095806. ISSN 1531-7331. ^ a b Tong-Xiang, Suk-Kwun, Di Zhang. "Biomorphic Mineralization: From biology to materials." State Key Lab of Metal Matrix Composites. Shanghai: Shanghai Jiaotong University, n.d. 545-1000. ^ Deville, Sylvain; Saiz, Eduardo; Nalla, Ravi K.; Tomsia, Antoni P. (2006-01-27). "Freezing as a Path to Build Complex Composites". Science. 311 (5760): 515–518. arXiv:1710.04167. Bibcode:2006Sci...311..515D. doi:10.1126/science.1120937. ISSN 0036-8075. PMID 16439659. ^ Munch, E.; Launey, M. E.; Alsem, D. H.; Saiz, E.; Tomsia, A. P.; Ritchie, R. O. (2008-12-05). "Tough, Bio-Inspired Hybrid Materials". Science. 322 (5907): 1516–1520. Bibcode:2008Sci...322.1516M. doi:10.1126/science.1164865. ISSN 0036-8075. PMID 19056979. ^ Liu, Qiang; Ye, Feng; Gao, Ye; Liu, Shichao; Yang, Haixia; Zhou, Zhiqiang (February 2014). "Fabrication of a new SiC/2024Al co-continuous composite with lamellar microstructure and high mechanical properties". Journal of Alloys and Compounds. 585: 146–153. doi:10.1016/j.jallcom.2013.09.140. ISSN 0925-8388. ^ Roy, Siddhartha; Butz, Benjamin; Wanner, Alexander (April 2010). "Damage evolution and domain-level anisotropy in metal/ceramic composites exhibiting lamellar microstructures". Acta Materialia. 58 (7): 2300–2312. doi:10.1016/j.actamat.2009.12.015. ISSN 1359-6454. ^ Bouville, Florian; Maire, Eric; Meille, Sylvain; Van de Moortèle, Bertrand; Stevenson, Adam J.; Deville, Sylvain (2014-03-23). "Strong, tough and stiff bioinspired ceramics from brittle constituents". Nature Materials. 13 (5): 508–514. arXiv:1506.08979. Bibcode:2014NatMa..13..508B. doi:10.1038/nmat3915. ISSN 1476-1122. PMID 24658117. ^ Villar, Gabriel; Graham, Alexander D.; Bayley, Hagan (2013-04-05). "A Tissue-Like Printed Material". Science. 340 (6128): 48–52. Bibcode:2013Sci...340...48V. doi:10.1126/science.1229495. ISSN 0036-8075. PMC 3750497. PMID 23559243. ^ Espinosa, Horacio D.; Juster, Allison L.; Latourte, Felix J.; Loh, Owen Y.; Gregoire, David; Zavattieri, Pablo D. (2011-02-01). "Tablet-level origin of toughening in abalone shells and translation to synthetic composite materials". Nature Communications. 2 (1): 173. Bibcode:2011NatCo...2E.173E. doi:10.1038/ncomms1172. ISSN 2041-1723. PMID 21285951. ^ Grunenfelder, L.K. ; Suksangpanya, N.; Salinas, C.; Milliron, G.; Yaraghi, N.; Herrera, S.; Evans-Lutterodt, K.; Nutt, S.R. ; Zavattieri, P.; Kisailus, D. (2014-09-01). "Bio-inspired impact-resistant composites". Acta Biomaterialia. 10 (9): 3997–4008. doi:10.1016/j.actbio.2014.03.022. ISSN 1742-7061. PMID 24681369. ^ Studart, André R. (2016). "Additive manufacturing of biologically-inspired materials". Chemical Society Reviews. 45 (2): 359–376. doi:10.1039/c5cs00836k. ISSN 0306-0012. PMID 26750617. ^ Killian, Christopher E. (2010). "Self-Sharpening Mechanism of the Sea Urchin Tooth". Advanced Functional Materials. 21 (4): 682–690. doi:10.1002/adfm.201001546. ^ Yao, Y.; Wang, Q.; Wang, H.; Zhang, B.; Zhao, C.; Wang, Z.; Xu, Z.; Wu, Y.; Huang, W.; Qian, P.-Y. ; Zhang, X. X. (2013). "Bio-Assembled Nanocomposites in Conch Shells Exhibit Giant Electret Hysteresis". Adv. Mater. 25 (5): 711–718. doi:10.1002/adma.201202079. PMID 23090938. ^ Youngblood, Jeffrey P.; Sottos, Nancy R. (August 2008). "Bioinspired Materials for Self-Cleaning and Self-Healing". MRS Bulletin. 33 (8): 732–741. doi:10.1557/mrs2008.158. ISSN 1938-1425. ^ Toohey, Kathleen S.; Sottos, Nancy R.; Lewis, Jennifer A.; Moore, Jeffrey S.; White, Scott R. (2007-06-10). "Self-healing materials with microvascular networks". Nature Materials. 6 (8): 581–585. doi:10.1038/nmat1934. ISSN 1476-1122. PMID 17558429. ^ Fu, Fanfan; Chen, Zhuoyue; Zhao, Ze; Wang, Huan; Shang, Luoran; Gu, Zhongze; Zhao, Yuanjin (2017-06-06). "Bio-inspired self-healing structural color hydrogel". Proceedings of the National Academy of Sciences. 114 (23): 5900–5905. Bibcode:2017PNAS..114.5900F. doi:10.1073/pnas.1703616114. ISSN 0027-8424. PMC 5468601. PMID 28533368. ^ Rampf, Markus; Speck, Olga; Speck, Thomas; Luchsinger, Rolf H. (September 2011). "Self-Repairing Membranes for Inflatable Structures Inspired by a Rapid Wound Sealing Process of Climbing Plants". Journal of Bionic Engineering. 8 (3): 242–250. doi:10.1016/s1672-6529(11)60028-0. ISSN 1672-6529. ^ Yuan, Y. C.; Yin, T.; Rong, M. Z.; Zhang, M. Q. (2008). "Self healing in polymers and polymer composites. Concepts, realization and outlook: A review". Express Polymer Letters. 2 (4): 238–250. doi:10.3144/expresspolymlett.2008.29. ^ "Inspired by Nature". Sharklet Technologies Inc. 2010. Retrieved 6 June 2014. ^ Yuan, Zhiqing (15 November 2013). "A novel fabrication of a superhydrophobic surface with highly similar hierarchical structure of the lotus leaf on a copper sheet". Applied Surface Science. 285: 205–210. Bibcode:2013ApSS..285..205Y. doi:10.1016/j.apsusc.2013.08.037. ^ Huh, Dongeun (25 June 2010). "Reconstituting Organ-Level Lung Functions on a Chip". Science. 328 (5986): 1662–1668. Bibcode:2010Sci...328.1662H. doi:10.1126/science.1188302. PMID 20576885. ^ Mayser, Matthias (12 June 2014). "Layers of Air in the Water beneath the Floating Fern Salvinia are Exposed to Fluctuations in Pressure". Integrative and Comparative Biology. 54 (6): 1001–1007. doi:10.1093/icb/icu072. PMID 24925548. ^ Borno, Ruba (21 September 2006). "Transpiration actuation: the design, fabrication and characterization of biomimetic microactuators driven by the surface tension of water". Journal of Micromechanics and Microengineering. 16 (11): 2375–2383. Bibcode:2006JMiMi..16.2375B. doi:10.1088/0960-1317/16/11/018. ^ Garrod, R. (4 October 2006). "Mimicking a Stenocara Beetle's Back for Microcondensation Using Plasmachemical Patterned Superhydrophobic-Superhydrophilic Surfaces". Langmuir. 23 (2): 689–693. doi:10.1021/la0610856. PMID 17209621. ^ Bhushan, Bharat (2009-04-28). "Biomimetics: lessons from nature–an overview". Philosophical Transactions of the Royal Society of London A: Mathematical, Physical and Engineering Sciences. 367 (1893): 1445–1486. Bibcode:2009RSPTA.367.1445B. doi:10.1098/rsta.2009.0011. ISSN 1364-503X. PMID 19324719. ^ Seo, Sungbaek; Das, Saurabh; Zalicki, Piotr J.; Mirshafian, Razieh; Eisenbach, Claus D.; Israelachvili, Jacob N.; Waite, J. Herbert; Ahn, B. Kollbe (2015-07-29). "Microphase Behavior and Enhanced Wet-Cohesion of Synthetic Copolyampholytes Inspired by a Mussel Foot Protein". Journal of the American Chemical Society. 137 (29): 9214–9217. doi:10.1021/jacs.5b03827. ISSN 0002-7863. PMID 26172268. ^ Ahn, B. Kollbe; Das, Saurabh; Linstadt, Roscoe; Kaufman, Yair; Martinez-Rodriguez, Nadine R.; Mirshafian, Razieh; Kesselman, Ellina; Talmon, Yeshayahu; Lipshutz, Bruce H. (2015-10-19). "High-performance mussel-inspired adhesives of reduced complexity". Nature Communications. 6: 8663. Bibcode:2015NatCo...6E8663A. doi:10.1038/ncomms9663. PMC 4667698. PMID 26478273. ^ "Gecko Tape". Stanford University. Retrieved 17 July 2014. ^ Vignolini, Silvia; Rudall, Paula J.; Rowland, Alice V.; Reed, Alison; Moyroud, Edwige; Faden, Robert B.; Baumberg, Jeremy J.; Glover, Beverley J.; Steiner, Ullrich (2012-09-25). "Pointillist structural color in Pollia fruit". Proceedings of the National Academy of Sciences. 109 (39): 15712–15715. Bibcode:2012PNAS..10915712V. doi:10.1073/pnas.1210105109. ISSN 0027-8424. PMC 3465391. PMID 23019355. ^ Dumanli, A. G.; van der Kooij, H. M.; Reisner, E.; Baumberg, J.J.; Steiner, U.; Vignolini, Silvia (2014). "Digital color in cellulose nanocrystal films". ACS Applied Materials & Interfaces. 7 (15): 12302–12306. doi:10.1021/am501995e. PMC 4251880. PMID 25007291. ^ Vignolini, Silvia; Gregory, Thomas; Kolle, Mathias; Lethbridge, Alfie; Moyroud, Edwige; Steiner, Ullrich; Glover, Beverley J.; Vukusic, Peter; Rudall, Paula J. (2016-11-01). "Structural colour from helicoidal cell-wall architecture in fruits of Margaritaria nobilis". Journal of the Royal Society Interface. 13 (124): 20160645. doi:10.1098/rsif.2016.0645. ISSN 1742-5689. PMC 5134016. PMID 28334698. ^ a b c d e f g Vignolini, Silvia; Moyroud, Edwige; Glover, Beverley J.; Steiner, Ullrich (2013-10-06). "Analysing photonic structures in plants". Journal of the Royal Society Interface. 10 (87): 20130394. doi:10.1098/rsif.2013.0394. ISSN 1742-5689. PMC 3758000. PMID 23883949. ^ Parker, Richard M.; Guidetti, Giulia; Williams, Cyan A.; Zhao, Tianheng; Narkevicius, Aurimas; Vignolini, Silvia; Frka-Petesic, Bruno (2017-12-18). "The Self-Assembly of Cellulose Nanocrystals: Hierarchical Design of Visual Appearance". Advanced Materials. 30 (19): 1704477. doi:10.1002/adma.201704477. ISSN 0935-9648. PMID 29250832. ^ Chandler, Chris J.; Wilts, Bodo D.; Vignolini, Silvia; Brodie, Juliet; Steiner, Ullrich; Rudall, Paula J.; Glover, Beverley J.; Gregory, Thomas; Walker, Rachel H. (2015-07-03). "Structural colour in Chondrus crispus". Scientific Reports. 5 (1): 11645. Bibcode:2015NatSR...511645C. doi:10.1038/srep11645. ISSN 2045-2322. PMC 5155586. PMID 26139470. ^ Schroeder, Thomas B. H.; Houghtaling, Jared; Wilts, Bodo D.; Mayer, Michael (March 2018). "It's Not a Bug, It's a Feature: Functional Materials in Insects". Advanced Materials. 30 (19): 1705322. doi:10.1002/adma.201705322. PMID 29517829. ^ Schenk, Franziska; Wilts, Bodo D.; Stavenga, Doekele G (November 2013). "The Japanese jewel beetle: a painter's challenge". Bioinspiration & Biomimetics. 8 (4): 045002. Bibcode:2013BiBi....8d5002S. doi:10.1088/1748-3182/8/4/045002. PMID 24262911. ^ Ball, Philip (May 2012). l "Scientific American" Check |url= value (help). Nature's Color Tricks. 306. pp. 74–79. doi:10.1038/scientificamerican0512-74. ^ Song, Bokwang; Johansen, Villads Egede; Sigmund, Ole; Shin, Jung H. (April 2017). "Reproducing the hierarchy of disorder for Morpho-inspired, broad-angle color reflection". Scientific Reports. 7 (1): 46023. Bibcode:2017NatSR...746023S. doi:10.1038/srep46023. PMC 5384085. PMID 28387328. ^ "Structural Blue: Color Reimagined / Discover the Global World of Lexus". discoverlexus.com. Retrieved 25 September 2018. ^ Cathey, Jim (7 January 2010). "Nature Knows Best: What Burrs, Geckos and Termites Teach Us About Design". Qualcomm. Retrieved 24 August 2015. ^ Cherny-Scanlon, Xenya (29 July 2014). "Seven fabrics inspired by nature: from the lotus leaf to butterflies and sharks". The Guardian. Retrieved 23 November 2018. ^ Sgro, Donna. "About". Donna Sgro. Retrieved 23 November 2018. ^ Sgro, Donna (9 August 2012). "Biomimicry + Fashion Practice". Fashionably Early Forum, National Gallery Canberra. pp. 61–70. Retrieved 23 November 2018. ^ "Teijin Limited | Annual Report 2006 | R&D Efforts" (PDF). Teijin Japan. July 2006. Retrieved 23 November 2018. MORPHOTEX, the world's first structurally colored fiber, features a stack structure with several tens of nano-order layers of polyester and nylon fibers with different refractive indexes, facilitating control of color using optical coherence tomography. Structural control means that a single fiber will always show the same colors regardless of its location. ^ "Fabric | Morphotex". Transmaterial. 12 October 2010. Retrieved 23 November 2018. ^ Savory, Allan; Jody Butterfield (1998-12-01) . Holistic Management: A New Framework for Decision Making (2nd ed. ed.). Washington, D.C.: Island Press. ISBN 1-55963-487-1. ^ Teague, W.R.; Dowhower, S.L. ; Baker, S.A.; Haile, N.; DeLaune, P.B. ; Conover, D.M. (May 2011). "Grazing management impacts on vegetation, soil biota and soil chemical, physical and hydrological properties in tall grass prairie". Agriculture, Ecosystems & Environment. 141 (3–4): 310–322. doi:10.1016/j.agee.2011.03.009. Retrieved 5 March 2019. ^ Undersander, Dan; Temple, Stan; Bartlett, Jerry; Sample, Dave; Paine, Laura. "Grassland birds: Fostering habitats using rotational grazing" (PDF). University of Washington Cooperative extension publishing. Retrieved 5 March 2019. ^ Weber, K.T. ; Gokhale, B.S. (January 2011). "Effect of grazing on soil-water content in semiarid rangelands of southeast Idaho" (PDF). Journal of Arid Environments. 75 (5): 264–270. doi:10.1016/j.jaridenv.2010.12.009. Retrieved 5 March 2019. ^ "Allan Savory: How to green the desert and reverse climate change." TED Talk, February 2013. ^ Thackara, John (June 2010). "Greener Pastures". Seed Magazine. ^ Retallack, Gregory (2001). "Cenozoic Expansion of Grasslands and Climatic Cooling" (PDF). The Journal of Geology. University of Chicago Press. 109 (4): 407–426. doi:10.1086/320791. ^ Stegmaier, Thomas; Linke, Michael; Planck, Heinrich (29 March 2009). "Bionics in textiles: flexible and translucent thermal insulations for solar thermal applications". Phil. Trans. R. Soc. A. 367 (1894): 1749–1758. Bibcode:2009RSPTA.367.1749S. doi:10.1098/rsta.2009.0019. PMID 19376769. ^ Wilson, S.J. Wilson; Hutley, M.C. (1982). "The Optical Properties of 'Moth Eye' Antireflection Surfaces". Journal of Modern Optics. 29 (7): 993–1009. Bibcode:1982AcOpt..29..993W. doi:10.1080/713820946. ^ Swedish Biomimetics: The μMist Platform Technology Archived December 13, 2013, at the Wayback Machine. Retrieved 3 June 2012. ^ Dujardin E., Peet C. "Nano Letters" 2003. 3:413. ^ Shenton W. Douglas, Young M. "Advanced Materials" 1999. 11:253. ^ Ischiro Yamashita, Junko Hayashi, Mashahiko Hara. "Bio-template Synthesis of Uniform CdSe Nanoparticles Using Cage-shaped Protein, Apoferritin." Chemistry Letters (2004). Volume: 33, Issue: 9. 1158–1159. Benyus, J. M. (2001). Along Came a Spider. Sierra, 86(4), 46-47. Hargroves, K. D. & Smith, M. H. (2006). Innovation inspired by nature Biomimicry. Ecos, (129), 27-28. Marshall, A. (2009). Wild Design: The Ecomimicry Project, North Atlantic Books: Berkeley. Passino, Kevin M. (2004). Biomimicry for Optimization, Control, and Automation. Springer. Pyper, W. (2006). Emulating nature: The rise of industrial ecology. Ecos, (129), 22-26. Smith, J. (2007). It’s only natural. The Ecologist, 37(8), 52-55. Thompson, D'Arcy W., On Growth and Form. Dover 1992 reprint of 1942 2nd ed. (1st ed., 1917). Vogel, S. (2000). Cats' Paws and Catapults: Mechanical Worlds of Nature and People. Norton.